Would you love to live in a house like this, and wake up to these spectacular panoramic views every morning? Well you can, if you rent this sensational 6 bedroom detached Villa with its own private pool, overlooking the beautiful unspoilt Marigot Bay and its marina. The architect who designed "Villa Bo Lanme," which means “home by the sea” in Creole, ensured almost every room in the property overlooks the fabulous view. "Villa Bo Lanme" (formerly Bay View Villa ownership unchanged), enjoys year round cool breezes, but on still days, there are ceiling fans throughout and air conditioning in all the bedrooms. There is a vast open plan living area with cool marble floors, including an exceptionally well equipped kitchen, dining and sitting areas, which are furnished to seat up to 12 people. There are 5 spacious double bedrooms, 4 ensuite with raindance showers, and a separate bathroom serves the 5th double bedroom, and the two double sofa beds in the Games room. The Games room will be a hit with the young at heart who can play X box, table tennis, snooker or table football, whilst the less energetic enjoy the outdoor living experience around the pool. Later the youngsters can retire to the TV or play videos, whilst the adults finish off their evening meal in peace on the veranda, overlooking the bay and the spectacular sunset. During the day you can stay local. Start with breakfast at the French bakery. Wander round the marina looking at the millionaire yachts. Restock with items from the local shops, banks and minimart. Call in at the office and arrange scuba diving, fishing, sailing, whale watching or a water taxi trip. Relax on the sandy spit, snorkel the reef or perhaps hire a pedalo. Return later to enjoy a meal at a local restaurant or a drink at the bar, watch the sun go down and swop stories with the sailing fraternity. Alternatively there is a wealth of activities and places to see all over the island, which the local managers will discuss with you on arrival, always knowing that your stunning villa awaits your return at the end of the day, when you can cool off with a swim and a drink, whilst you decide what to do with your evening ahead. "Villa Bo Lanme" is ideal for honeymooners or couples who want time and space to themselves in privacy, wedding parties, family reunions, business conventions or simply 2 or 3 families wishing to holiday together. Whoever you are, this is somewhere where you can enjoy yourselves without being worried about disturbing the neighbours. If you would like to know more or just make contact with the owners Chris and Liz Beeching direct, (see photo below), just click on the “Enquire now” button on the panel to the right, and they will be delighted to hear from you. All the showers are large walk-in luxury rain showers. House keeping is provided twice a week, but more often can be provided at additional cost. A chef can be provided at an additional cost. The pool is not heated but it is warm all year round. A local Taxi service is available. A local car hire is available. There is a full massage and beauty treatments salon 800 meters from the property. Please ask if anything else in particular is missing, I am sure most things can be provided. This was our second visit to Villa Bo Lanme and hopefully it won't be our last. Whether you are the adventurous type and want to discover all the beauty that St. Lucia offers, or you simply want to relax and enjoy some breathtaking views in between dips in an amazing pool, then take a serious look at this villa. It is superbly designed inside and out, and the property is absolutely immaculate and extremely functional. This villa will serve you well for any occasion whether you are just two or three, or a larger group of family and friends wanting to share some memorable moments. From beginning to end of your vacation at Villa Bo Lanme, you will be met with nothing short of professionalism and top notch customer service from Chris and all of his staff. Once again, I highly recommend this property. I will be back! The pictures don’t do it justice, a group of 11 of us stayed here for my 40th and it couldn’t have been more perfect. Thanks to Chris for all the information about Marigot Bay anf St Lucia and for helping us arrange transfers to and from the airport. I hope to be back soon!! We are two older couples and three singles who stayed at Bo Lanme for 2 weeks. Have stayed at villas for about 20 years. This had more than enough room for us and is very clean. Housekeeper Gail is fastidious.The view off the porch was the most impressive we ever had! Marigot Bay is just lovely. Some of us walked each morning and met neat people from all over. We cooked in mostly; kitchen and grill were very adequate. Laundry worked well. Owner Chris gives lots of helpful info about everything. Managers Pauline and Cornelius were very helpful with some little issues and their response was immediate. For a quick beach, take the free ferry to Doolittles, use the lounges at the beach, (I don't think we were supposed to but nobody bothered us). Eat and/or drink at Doolittles (or not). The ferry driver didn't seem to worry about it. We did enjoy Doolittles for some eating and drinking along with their free pool and outdoor hot water shower! We tried other restaurants at Marigot also. All were good. Vigie beach is very pleasant with palm trees and easy in/out water. North end at Rendevous Resort has very calm water. Pidgeon Point beach worth the drive north; calm water and interesting history. Reduit Beach is THE beach on the island but touristy. Lots of stores for shopping and fine restaurants. We took a boat ride with Cornelius to Anse Chastenet for lunch there and some good snorkeling, then to Sugar Beach where they have free lounges. Both were excellent! We drove to the sulfur springs one day when we were feeling adventurous (driving on St. Lucia is an adventure). There are very good guides to take you close to the springs. A lot of people were enjoying getting mud baths. We then went to Dasheene Restaurant at Ladera Resort. Do it! Lunch was awesome and the view of the Pitons was downright thrilling. Since we ate there, they said they would take us down to Sugar Beach, but unfortunately, we didn't have enough time. You should get an early start for this day. We also toured the rum distillery in Roseau. Tour was basic but the tasting was,uh, very liberal. Our vacation was a combination of adventure and relaxation. Several days, we just stayed at the villa. Plenty of room to be by yourself, read a book, enjoy the view, and swim in the pool. We were very happy with the whole experience. Outstanding gorgeous villa with one of most beautiful views in St. Lucia!!! The staff associated with the villa was excellent providing for our every need! One of our best vacations ever! Highly recccommend Vill Bo Lamen!!!! This villa is large and absolutely amazing. Every part of the villa is perfect and everything in the VRBO listing proved to be accurate. The location is fantastic with magnificent views of Marigot Bay, the most beautiful bay in St Lucia. Pauline manages the property and is very helpful. She set us up with a chef named Joel Placide who cooked dinner one night and he was fantastic. One other amazing thing about this property is the amount of information the owner sent us before our arrival. We received over 60 pages of very detailed and accurate information about the entire island. That information was incredibly helpful for our visit. I have never had an owner send me that amount of useful information. I strongly recommend this property. It is absolutely fantastic!! CThe home is lovely, spacious, and clean with a gorgeous view. Perfect for a large group! The information from Chris was so very helpful and thorough. Msnagers Pauline and Cornelius were wonderful and responsive to our questions. We snorkeled in 3 beautiful sites with Cornelius-an excellent adventure!! We spent lots of time in the pool with assorted floaties. Loads of towels and bed linens with efficient appliances for laundry. The kitchen is fully equipped and the dining area is large - seats 12 or more. All in all a beautiful home, lovely grounds, close to the little town, very friendly people!! Our group ranged in age from 15 to 74 - three generations. To a person we all loved the experience!! Thank you so much and happy new year!! Marigot Bay has been described as one of the most beautiful bays in the Caribbean. It is visited by yachts everyday because of its safe anchorage and well equipped marina, along with its shops restaurants and bars. The marina has provided many jobs for the locals who therefore appreciate the value of tourists. In the evenings locals, tourists and ex-pats can be found everywhere enjoying each others company, which makes for a happy and safe environment. 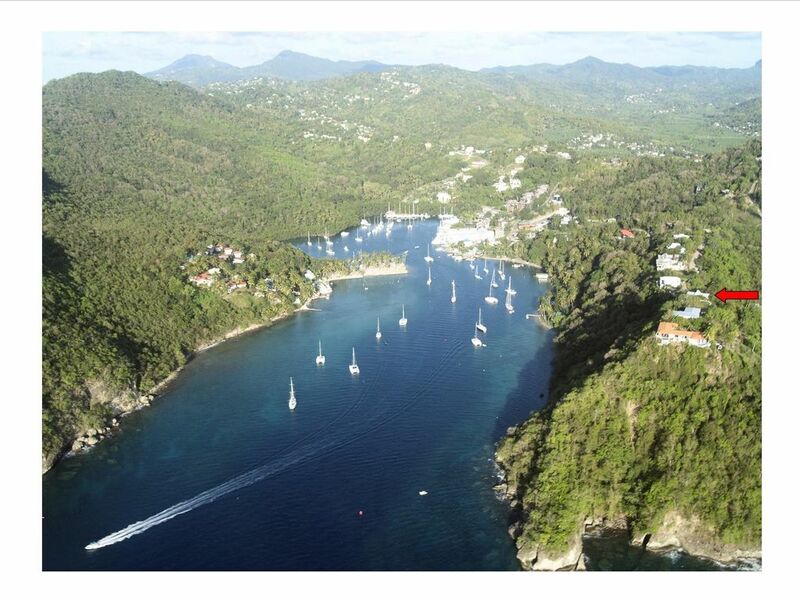 Marigot Bay is a perfect mix of unspoilt beauty and quality development. There is plenty of parking, and the roads are quiet. There is a taxi rank, and the buses run from the main road. It is recommended to hire a car for a few days of your holiday at least, to give you the freedom to explore and enjoy this wonderful island. Full directions and information regarding car hire and taxis will be given at the time of booking. Guest party enjoys exclusive use of Villa and Pool. Rental includes a housekeeper twice a week, pool and garden maintenance, and basic household items. We do not add any extra charges for government tax, service charge, resort tax, fees or Vat, so you do not need to make any further allowance for these items. Payments may be made by credit card, pay pal, direct transfer or online payments.